After You Shoot: Turning Your Photos Into a RealPlace! Note: Before you take advantage of this tutorial, we recommended you at least skim "Before You Shoot", which will help you take pictures that make great Places. Do not be intimidated by the length of this tutorial! It's very detailed, hopefully for your benefit. :-) Once you are familiar with the process, you can create small places in minutes. When you have taken at least one set of eight images (one spot) and loaded them into your computer, this tutorial will guide you through creating your first Real Place. These are steps you will take. Note: This page is undergoing a major reconstruction. But go ahead and use it - it should still prove very helpful! Click the "Create" tab at the top of the page. 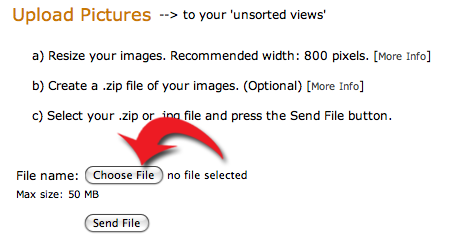 Reducing the size of your images before uploading is not required, but will help save upload time and processing time. The easiest way to upload several (or many) images is to zip them up into one .zip file. For more info see How to create a .zip file, below. After you have created a .zip file, click Choose File or Browse (depending on your browser), locate the file on your computer and select it. Click Send File. A progress indicator will be displayed as your file uploads. 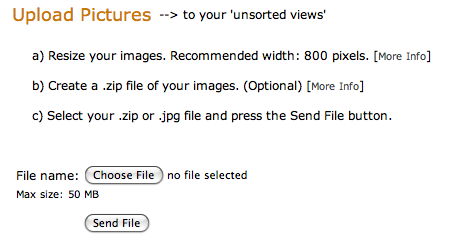 As with all web-based uploads, DO NOT leave this page until the file has been completely uploaded. Leaving will cancel the upload. Note: Safari sometimes has difficulty getting started. If that happens, just click cancel/retry and then click Send again. It should kick right in. Once uploaded, you will see a countdown as the server processes your images. It's okay to leave the page while this is happening. When you see "Imported N of N image files" (or an error), your processing is complete. Once you've uploaded your files, you need create a "Place" to put them in. A place is made up of one or more related Spots (described below), and is simply the area you are showing the world through your pictures. First click Sort, which is below the Create tab near the top of the page. On the left hand side of the screen, under My Places, click New. 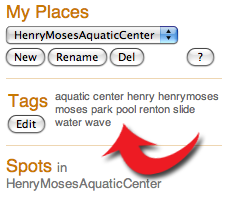 After you create your place a Tags section will appear between My Places and Spots. This is a good time to tag your place with keywords that will help users find it when they search. 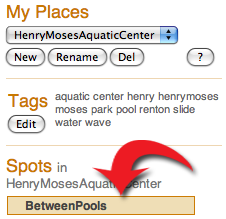 Click "Edit" and enter keywords that describe your place. At the very minimum you should try to include the city, state, neighborhood and place name, as appropriate. 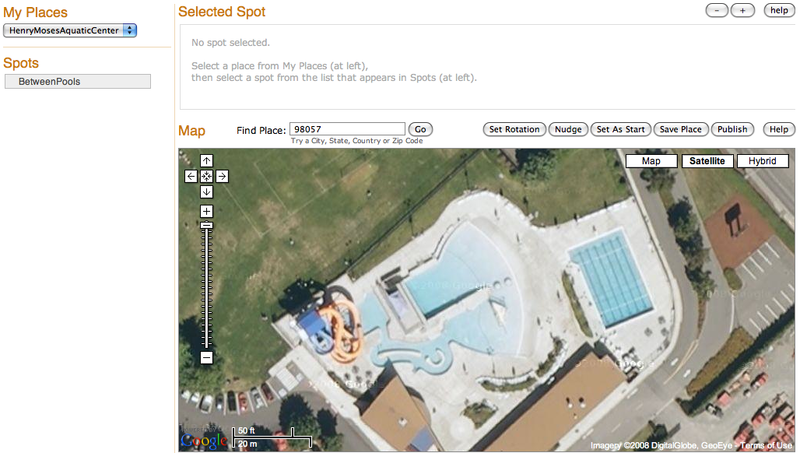 Add descriptive words like "park" or "pool" that will help people find your place. The more keywords you enter, the more visibility your place will get. But keep it reasonable. A spot is one specific location where you can stand and look around. At this point you should have a bunch of images (at least 8) in your Unsorted bin, and your job is to sort them into their respective spots. If you shot them "in order" it will be very fast and easy, but even if you shot some of them out-of-order, you can take care of it here on this page. Find the first photo of your first spot. (If you have not renamed your photos, they should display in the sequence in which you took them - hopefully in clockwise order, i.e. turning to your right). Using the "Start dir" option menu, select the compass direction you were facing when you took that first photo. NOTE: If you don't get this right, you can adjust it later. Click the first photo of your spot. It will get a small facing-direction label. In this example, the 'N' stands for North. Then click Grab 8 or press "G" on your keyboard (assuming that the next 7 photos are in directional order. 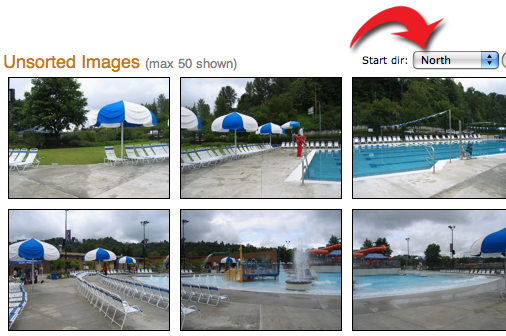 If they are not in order, shift-click or alt-click on each image in clockwise order, selecting all 8). All 8 directional views should now be labeled with a small directional tag. If you have any zoomed views for this spot you should shift-click or alt-click to select them now as well. They will be labelled 'z1', 'z2', etc. For more info on zoomed views, see Adding Zoomed Views below. When all views associated with this spot are selected click Make Spot, enter a spot name and click OK. Make Spot creates a new entry in your spot list (on the left side of the page), and moves the selected photos from your unsorted bin into the new spot. The new spot will be selected and the "Selected Spot" section above will show the views arranged side-by-side, labeled by direction. If you find that your images are ordered correctly, but not aligned properly with the directional labels, you can use the (<<) and (>>) buttons to "rotate" the image positions by one slot in either direction. If you are not very familiar with the physical location of your place you will want to remember this feature! If your spot views are not ordered correctly, or zooms got mixed in with the main views, or something else went wrong, you can click Dump To Unsorted to return your spot's images to the Unsorted Images area and delete the spot. Then you can grab the images again and recreate your spot. Note: While the Locate/Link page has a similar Selected Spot section, the rotate, rename and dump features are only available on the Sort page. If you have more spots, repeat the steps above until your unsorted images have been depleted. Once you have created all your spots, click Locate/Link under the Create tab at the top of the screen. Type in the most specific information that you know in the search box using country, state, city or US zip code (no address search yet). Zoom in on the map to where you took your photos. You may want to check both Satellite view and Map view to see which has the best detail for your area. Click the name of the spot you just created in the spots list. If you have more than one spot, just select one that will be easy to locate on the map. When you select your spot at the left, its images will appear at the top of the page in the Selected Spot section. Click on the map where this spot is. Use the images above to help find the right position. Just get it close with this first click. A red marker will be displayed where you placed the spot. Now you can make finer adjustments to the position of the spot by using the arrow keys. Shift-arrow keys move faster. Remember, it helps to look at the images above for visual cues. TIP: If you're really far off, hold down the "M" (move) key and click a new position. The marker will move directly to where you click. 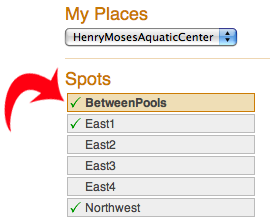 As each spot is located on the map, a check mark will appear next to its name in the Spots list to the left. It's very helpful to pay attention to these check marks when your place has several or many spots. Repeat the steps above for each of the spots you have created. You'll know you're done when all spots have check marks. If you have just a single spot, then skip the next section and jump down to Visitor Settings below. Once you have placed all your spots on the map it's time to link them together. This defines where people can "walk" from spot to spot. The linking UI is fairly easy to use, but not easy to discover. Sorry about that, it will get better! You have a lot of creative freedom in how you link spots together. For example, you are not constrained by distance or real-world objects. If you want to allow your users to walk through a wall or cross a chasm, you can do so. Do what feels right. Select a spot. You can click on its name in the spot list or directly on its marker on the map. Hold down either the "C" or "L" key (connect/link) and click an adjacent spot which will create a link between these two spots. NOTE: "C" and "L" are functionally identical. A line will appear between the spots to show they are linked. You'll need to remember to release the C/L key when you want to select a different spot, otherwise you'll create another link. 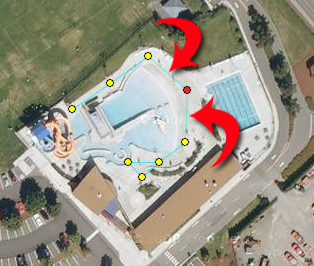 In the image below, the selected spot (red marker) is linked to two other spots. Connect all the spots in your place by repeating this process. NOTE: At the moment it is not readily apparent how to delete links. Again, it will get better. For now, you delete a link by simply clicking on it. Sometimes they can be tricky to click. If you're having trouble, try moving a few pixels on either side of the line. Links are actually composed of two parts, a move from spot A to spot B and a move from spot B to spot A. You will be asked separately if you would like to delete both these moves. Making this process easier is one of the many things on our ToDo list. First, you get to choose where visitors will start when they arrive at your place. 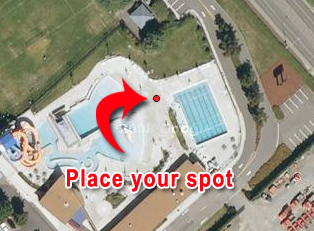 Select the spot where you'd like people to start by clicking on its name in the spot list or click directly on its marker on the map. Then click Set as Start. You will be asked for the initial direction you would like visitors to face (at that spot) when they arrive. Enter it and click Ok.
You also get to decide what the map looks like when users arrive at your place. Select a zoom level and map style (Map/Satellite/Hybrid) that will be most appropriate when your visitors are walking around. When users come to visit your place, the map will be displayed with the map position, style and zoom level that you just saved. Congratulations! You've just created your first Real Place. You've sorted, linked, located and saved. You're ready for action! Preview/Publish is where you can do all of the above. Click Preview/Publish under the Create tab near the top of the screen. If you came to this page directly from one of the Create pages after making your place, it should already be loaded and ready to go. If not, select your place in the My Places menu in the upper left part of the page. 1) Give it a try - walk around! The first thing to do is just take a look around your place. Walk around and make sure when you rotate around your spots that the views match up as expected. Make sure your links between spots work as expected. Make sure your zooms are positioned correctly on the views and that they show the proper image when clicked on. Basically, just take a look at everything and make sure it's working! You can easily jump back and forth to the Sort and Locate/Link pages to tweak things up. As you are looking around, take note of any particularly nice first-person views you see. When you see one that would, at a small size, do a decent job of visually representing your place, click the Set Thumbnail button. 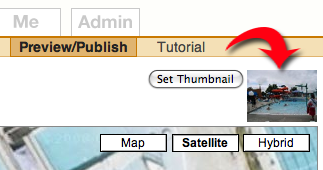 When you click it, a small "thumbnail" image of that view will be created and displayed next to the button. This thumbnail is the image that will be represent your place on the Find Places page and other places later as well. You can change the thumbnail at any time by clicking the Set Thumbnail button. The existing thumbnail will be replaced with a small version of the current view. 3) Descriptions and comments: "Plogs"
Descriptions and commentary about places helps bring them to life! Whether you're providing information about a facility, pointing out architectural features of a building, asking questions about hours of operation or a piece of artwork, it all helps make your place more interesting and rewarding for other people to visit. Your overall place, and each separate view, all have their own individual comment streams, which we have nicknamed: plogs (place logs). Plog entries are called comments, and can be written by both you and your visitors. Place Comments contain information about the entire place, and View Comments contain information about one specific first-person image/view. Below the map and first-person images you will see links called: "Edit Place Description" and "Add Place Comment"
There is at most one single Description for each place or view. Descriptions can only be edited by the place creator (so no avatar). Descriptions are always displayed at the top, above all comments. The main reason for descriptions is to give the place creator the ability to put a descriptive comment above everyone else's comments at any time. The intent of the comment stream is that it's a place where people can ask questions, make comments, and have a conversation. 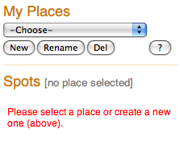 But there is always a spot "reserved" at the top for the place creator to describe the place or view. The general process of adding initial comments is as follows: First, you should always enter at least a short description of your place in the Place Comments tab. Then, just walk around your place. As you see things of interest, enter view descriptions or comments, which will automatically be linked to the view you are looking at. Descriptions and comments are immediately visible as soon as you enter them, and a count of how many comments exist for a given place or view is shown in the Place Comments / View Comments tabs. You can send this URL to friends, or use it to create a direct link from your own web site. Click "[show URL]" at any time for a reminder of the URL for your place. Then with 1 click you can "publish" your place, and we really encourage you to do this with all of your places that are more than just testing or fooling around. 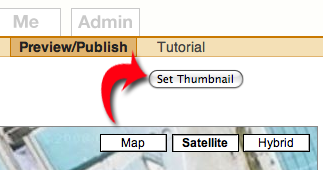 Simply click the Publish button on this page, above the map. The status will change from a red "NOT published" to a green "Published", and the button will change from Publish to Unpublish. What does "Publishing" my place actually do? Important: Publishing does not make your place immediately visible to all RealPlaces visitors. It does make your place visible to all users who are signed in and have opted to see new, unrated places. And anyone with an account can easily opt to see all such places and rate them. As soon as your place has a RealPlaces community rating, it becomes visible to everyone, including guests and unregistered users. So it's important that as members of this community we look at other people's places and rate them! If you have comments on this or any other aspect of RealPlaces, please go to the Learn->About->Contact page and send us feedback. Thanks! A Zoomed View, or just Zoom for short, is simply a close-up picture of something of interest in your place. They are often, but not always, an enlargement of something visible on one of your standard views. But you have complete creative freedom to use zooms however you like. This can result in some very cool and creative outcomes! 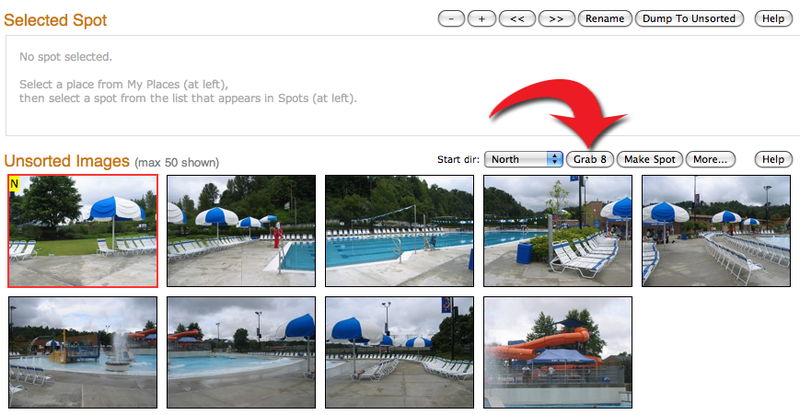 You can attach, adjust and delete zooms on either the Sort or Locate/Link pages. When you select a spot in the Spots List, the views that comprise that spot are shown in the Selected Spot pane. The main 8 directional views are always displayed in clockwise order, starting with the view facing north. Any other views which are associated with that spot are called zooms, and are displayed after the main directional views (with a yellow border). The top row of views is labeled, so if your window is wide enough or if the view images are small enough to fit in a single horizontal row you will see the zooms labeled "Zoom1", "Zoom2", etc. Currently, you cannot double-click on a zoom to show a larger image, although you can click the [+] button to enlarge all views in the selected spot. You attach zooms to the main directional views by dragging the zoom image directly onto its corresponding main view. A tiny thumbnail of the image will follow your mouse pointer to help you align the zoom onto its main view. In this example, we see a blockhouse in the distance toward the south, and we are attaching a close-up view right onto the blockhouse itself. When you release the mouse button, the zoom is placed on the main view at its current position. It will change appearance to display the zoom number, so you can see at a glance which zooms have been placed. Adjust a zoom position by simply dragging the yellow "attached-zoom" icon around inside its view. It's that easy. It is designed to be a bit "sticky" at the edges to allow you to easily place a zoom right at the edge of a view. To delete a placed zoom, drag it off its main view in any direction. You will need to give it a little "tug" when it gets to the edge. The zoom icon will change appearance to show that it will be deleted. If you change your mind you can drag back inside the main view to re-attach it. The icon's appearance indicates what action will take place (adjust or delete). Zooms do not have to be traditional, as in the example above. With typical 360 degree-type web sites or plug-ins, all you can do is enlarge your existing view. If an object of interest is partly obscured by a tree branch and you zoom in, everything gets larger - including the branch, which still obscures your object! 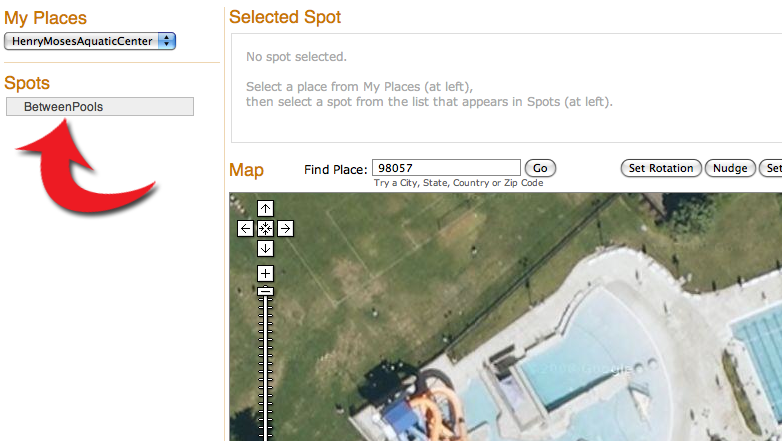 With RealPlaces zoomed views you can attach a much better picture by merely stepping around or in front of the branch. Zooms can be used in almost any manner your imagination allows. In the example above, the sign in the NW view is distant and angled so it's barely visible. Even tripling the magnification would not make it legible. But with RealPlaces that's not a problem - just take a picture of the sign from a closer position, at a better angle, and attach it to the main view! Have fun. Experiment. Make something cool that we can highlight and point out to others! Mac OS X: Select all the images you wish to zip up, then ctrl-click (or right-click) on one of the files and a menu will pop up. In OS X 10.5 or 10.6 select "Compress [N] Items" (where N is the number of files you have selected). In OS X 10.4 select "Create Archive of [N] Items". A file called "Archive.zip" will be created in the same folder with the selected images. Windows XP/Vista: Select all the images you wish to zip up, then right-click on one of them to bring up a menu. Move your mouse to the "Send To" menu item. Another menu will appear where you should select "Compressed (zipped) Folder". A special "zipped" folder will be created inside the same folder as your images. It will have the same name as the image file you right-clicked on. Uploading this folder on the RealPlaces Upload page will send all the enclosed image files at once.